At Total Bird Control we provide bird netting services throughout the UK. This method comprises of nylon netting, fixed to a wire rope frame that is pre-tensioned. The result is an extremely strong net that no bird can pass through. Birds also find the net very difficult for them to land or perch on. Nets are fixed to the ground using a multitude of methods, with masonry bolts and clamp systems mostly commonly used. Sometimes further support structures might need constructing for additional wiring. All components and fittings are either stainless steel or galvanised for guaranteed long life. Bird netting is a highly effective and low profile solution to pest bird infestations. It creates a physical barrier and prevents them from entering areas that need to be protected. It is also a discreet solution because they can hardly be seen at a distance, they are silent, and you don’t need a power source to operate it. Bird netting is used in many locations including sports stadiums, warehouse ceilings, bridges, underpasses, gardens, to protect crops, eaves and rafters of buildings, domestic properties, factories etc. They offer a humane solution to any bird control problems that you may be facing. Without netting birds like pigeons, seagulls, and crows can cause significant damage to properties, contaminate buildings with their droppings, and be a massive nuisance to spectators in sports stadiums. Bird netting is highly efficient and a very affordable way of dealing with this problem so if you are experiencing a bird control problem then please do not hesitate to contact us. Bird and pigeon netting is very effective in preventing access to recesses, alcoves and balconies which are usually hard to protect effectively using other methods. 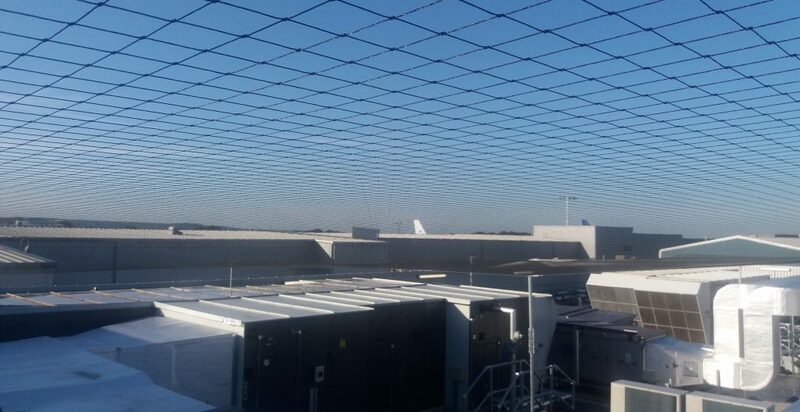 The bird netting is inconspicuous when viewed from a head on angle so there is no need to worry about how the environment will look, you will hardly notice the net being there. At Total Bird Control we have worked on many bird netting projects and have helped both home owners and business owners deal with their bird control problems. Our expert team can advise you on the best course of action to take and will be happy to survey the site where you are experiencing the problem and provide you with a cost effective and permanent solution. If you are looking for bird netting and pigeon control services then contact us now and speak to one of our specialist team.